3rd Sunday newspaper story; 17 Mar - 21 Jul 1940. Previous Frew appearances: #51 (1952), #1032 (1993). 4th Sunday newspaper story; 28 Jul - 29 Dec 1940. Previous Frew appearances: #44 (1952), #222 (1962), #1032 (1993). 5th Sunday newspaper story; 5 Jan - 23 Feb 1941. Previous Frew appearances: #235 (1963), #366 (1968), #1032 (1993). 92nd daily newspaper story; 2 Aug 1965 - 1 Jan 1966. Previous Frew appearances: #314/5 (1966), #467/8 (1972), #641/2 (1978), #851/2 (1986). 79th Sunday newspaper story; 5 Apr - 14 Jun 1970. Previous Frew appearances: #462 (1971), #636 (1978), #845 (1986). 80th Sunday newspaper story; 21 Jun - 13 Sep 1970. Previous Frew appearances: #463 (1971), #637 (1978), #846 (1986). 100th Sunday newspaper story; 5 Sep - 19 Dec 1976. Previous Frew appearances: #620 (1977), #830 (1985). 154th daily newspaper story; 28 May - 8 Sep 1984. Previous Frew appearance: #824 (1985). 122nd Sunday newspaper story; 26 Aug 1984 - 17 Feb 1985. Previous Frew appearance: #829 (1985). 156th daily newspaper story; 24 Dec 1984 - 1 Jun 1985. Previous Frew appearances: #834/5 (1985). 123rd Sunday newspaper story; 24 Feb - 9 Jun 1985. Previous Frew appearances: #835 (1985). First published in Fantomen by Semic, Scandinavia in Nr.26/1986. This story is reprinted from Frew #916 in 1986. 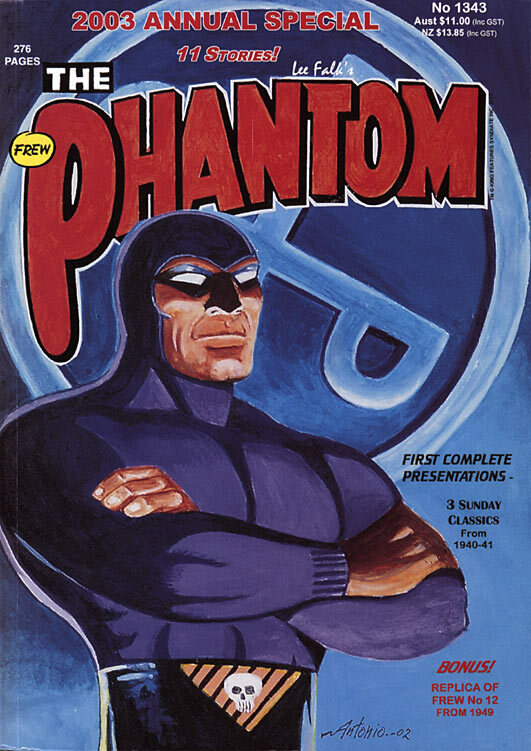 Frew is proud to bring you our 2003 Annual Special, a 276-page collection of some of the most famous Phantom adventures. As usual, we have included a bonus offering - a replica - Frew's No 12 edition from 1949, which contains an abridged version of The Shark's Nest illustrated by Ray Moore. The highlights of this year's Annual Special are the first-ever complete presentations of the 1940-41 Lee Falk classics, The Fire Goddess, The Beachcomber and The Saboteurs . An editorial feature on page 269 gives you a lot of background on the three stories and in part, at least, reveals how the team at Frew managed to restore art repros which are now more than 60 years old! It was a true Mission Impossible challenge! Very special thanks are extended to King Features archivist Mark Johnson for his help in assisting Frew to reassemble these old stories. There are thanks also due to a great many people who helped Frew in so many different ways during 2002 in our constant search for old stories and historical data. In no special order ... Robert Griffin, Pete Klaus, Howard Gesbeck and Ed Rhoades in the United States and Barry Stubbersfield, Ian Dale and Julian Lewis in Australia. A million thanks are also due to Judith Shepherd and Ruth Le Brun, in Frew's Sydney office, who once again kept the good ship Frew on course as they battled daily production, distribution and translation problems and somehow succeeded in keeping the boss in check! Dramas aside, 2002 was another exciting time for Frew. We managed to bring you more complete presentations of Lee Falk stories. We achieved a scoop of sorts by being the first publishing house in Australia and New Zealand to present the world's first full-length The Phantom and Mandrake crossover adventure. 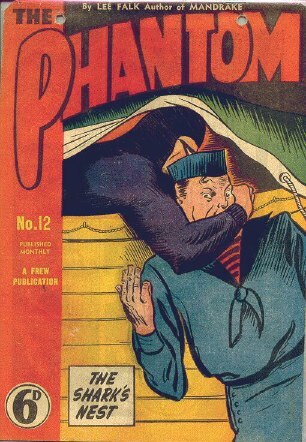 We also startled more than a few enthusiasts with the release of two stories which explored what would have happened if the first Phantom had been washed ashore in Japan and dived into the archives of the Egmont publishing house in Scandinavia to unearth the first of what will be a continuing series of old and unpublished Phantom adventures stretching back to the seventies. During 2003, as Frew edges closer to its 55th year of publishing The Phantom comic book (and I near my 16th year as Publisher) we will strive to maintain the standards. It is a surprisingly demanding business to operate. Rewarding, but stressful, with 31 editions and 50-odd stories to be whipped into shape, translations from Swedish to English, re-lettering, cover artwork to be commissioned, ancient artwork to be tracked down (and invariably, to be restored) and underpinning the whole operation, constant research. The enthusiasm of so many people who help and especially the support of our readers, makes it all worthwhile, I always look forward to attending formal and informal gatherings of the Friends of The Phantom organisation in the United States and the Bengali Explorers Club in Australia. They are always entertaining - and you never know who you may run into. The great and genial Sy Barry himself, for example, in New York in May last year! My thanks to the staff of Frew Publications for providing this information. Frew in Review: 1997, 1998, 1999, 2000, 2001. Annual Specials: 2000, 2001, 2002, 2003.